Presentations of our finding are important to showcase our work for Palau's shark conservation and environment protection. local Government officials, the President of Palau, Traditional Leaders, Tourism Boards all throughout Micronesia, scientific groups and numerous International events such as dive shows in USA, Germany and Singapore. Every year the Micronesian Shark Foundation is organizing Shark Week Palau, an event realized in cooperation with Fish'n Fins, Palau's most prestigious dive operator. During shark week Tova Harel Bornovski , along with international shark experts, whom we regularly invite for these events, give presentations and talks. Citizen science is promoted as a simple and cost-effective alternative to traditional approaches for the monitoring of populations of marine megafauna. However, the reliability of datasets collected by these initiatives often remains poorly quantified. We compared datasets of shark counts collected by professional dive guides with acoustic telemetry data from tagged sharks collected at the same coral reef sites over a period of five years. There was a strong correlation between the number of grey reef sharks (Carcharhinus amblyrhynchos) observed by dive guides and the telemetry data at both daily and monthly intervals, suggesting that variation in relative abundance of sharks was detectable in datasets collected by dive guides in a similar manner to data derived from telemetry at these time scales. 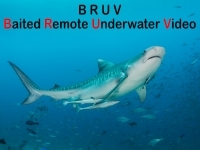 There was no correlation between the number or mean depth of sharks recorded by telemetry and the presence of tourist divers, suggesting that the behaviour of sharks was not affected by the presence of divers during our study. Data recorded by dive guides showed that current strength and temperature were important drivers of the relative abundance of sharks at monitored sites. Our study validates the use of datasets of shark abundance collected by professional dive guides in frequently-visited dive sites in Palau, and supports the participation of experienced recreational divers as contributors to long-term monitoring programs of shark populations. Environmental Influences on Patterns of Vertical Movement and Site Fidelity of Grey Reef Sharks (Carcharhinus amblyrhynchos) at Aggregation Sites Gabriel M. S. Vianna , Mark G. Meekan, Jessica J. Meeuwig, Conrad W. Speed Published: April 10, 2013https://doi.org/10.1371/journal.pone.0060331 We used acoustic telemetry to describe the patterns of vertical movement, site fidelity and residency of grey reef sharks (Carcharhinus amblyrhynchos) on the outer slope of coral reefs in Palau, Micronesia, over a period of two years and nine months. We tagged 39 sharks (mostly adult females) of which 31 were detected regularly throughout the study. Sharks displayed strong inter-annual residency with greater attendance at monitored sites during summer than winter months. More individuals were detected during the day than at night. Mean depths of tagged sharks increased from 35 m in winter to 60 m in spring following an increase in water temperature at 60 m, with maximum mean depths attained when water temperatures at 60 m stabilised around 29°C. Sharks descended to greater depths and used a wider range of depths around the time of the full moon. There were also crepuscular cycles in mean depth, with sharks moving into shallower waters at dawn and dusk each day. We suggest that daily, lunar and seasonal cycles in vertical movement and residency are strategies for optimising both energetic budgets and foraging behaviour. Cyclical patterns of movement in response to environmental variables might affect the susceptibility of reef sharks to fishing, a consideration that should be taken into account in the implementation of conservation strategies. Indicators of fishing mortality on reef-shark populations in the world’s first shark sanctuary: the need for surveillance and enforcement Authors: Gabriel M. S. Vianna, Mark G. Meekan, Jonathan L. W. Ruppert, Tova H. Bornovski, Jessica J. Meeuwig Shark sanctuaries are promoted as a management tool to achieve conservation goals following global declines of shark populations. We assessed the status of reef-shark populations and indicators of fishing pressure across the world’s first shark sanctuary in Palau. Using underwater surveys and stereophotogrammetry, we documented large differences in abundance and size structure of shark populations across the sanctuary, with a strong negative relationship between shark densities and derelict fishing gear on reefs. Densities of 10.9 ± 4.7 (mean ± SE) sharks ha−1 occurred on reefs adjacent to the most populated islands of Palau, contrasting with lower densities of 1.6 ± 0.8 sharks ha−1 on remote uninhabited reefs, where surveillance and enforcement was limited. Our observations suggest that fishing still remains a major factor structuring shark populations in Palau, demonstrating that there is an urgent need for better enforcement and surveillance that targets both illegal and licensed commercial fisheries to provide effective protection for sharks within the sanctuary.